The major research in the resource management literature focuses primarily on two complementary sub-problems: (1) specification languages for formulating resource requests and (2) constraint problems modelling allocation and scheduling. Both directions assume the knowledge of the underlying platform architecture and the dependencies it induces on the usage of the various resources. 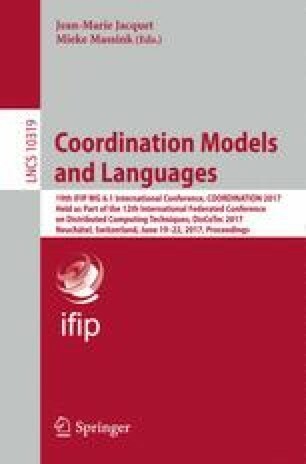 In this paper, we bridge this gap by introducing constraint-flow nets (cfNets). A cfNet is defined by a set of resources and dependencies between them, each dependency having an associated constraint schema. The model is inspired by Petri nets, with resources corresponding to places and dependencies—to transitions. Given an architecture of dependent resources, an initial resource request is propagated through the dependencies. The generated constraints are then conjuncted into the global allocation constraint. We study the notion of conflicts in cfNets and prove that for conflict-free cfNets the global allocation constraint can be constructed unambiguously. Furthermore, we provide an SMT-based algorithm for conflict detection and discuss the use of priorities to dynamically resolve conflicts at run-time. Finally, we illustrate the use of cfNets on a case study inspired by the Kalray MPPA architecture. This paper has received a large number of very constructive comments. Although—mostly due to space and time limitations—we did not manage to address all of them, we are very grateful to the anonymous reviewers for their suggestions that we hope to implement in our future work.